It’s time to go on a treasure hunt in Fortnite this week as you search the map for a Battle Star. One of this week’s challenge involves finding a Battle Star hidden between three points on the map. Similar to the challenge that had you search between three ski lodges, you’ll need to search between a mysterious hatch, the giant rock lady and a precariously balanced flatbed lorry to find this one. 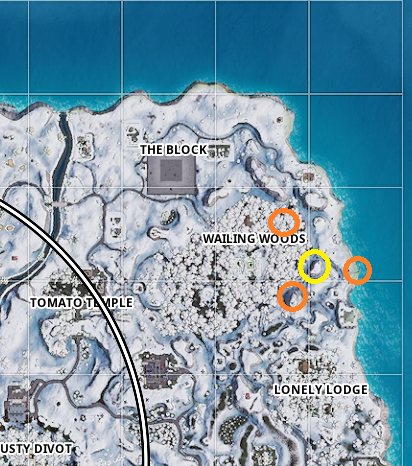 These locations are situated Southeast of Wailing Woods for the most part and are fairly close together in the I3, I4 and J4 quadrants. We’ve highlighted the locations in orange for you, so they’re easier to find. You’ll be able to find the Battle Star on the hill north of where you find the rock lady. We’ve marked the location in yellow on the map.